"This pasta dish is my signature dish. I really enjoy making this pasta, especially with the right ingredients like guanciale. Top with freshly grated Parmesan cheese." Fill a large pot with lightly salted water and bring to a rolling boil. Stir in bucatini and return to a boil. Cook, uncovered, stirring occasionally, until bucatini is tender, about 11 minutes. Drain. Heat oil in a large skillet over medium-high heat. Add garlic cloves; cook until golden brown, about 1 minute. Remove with a slotted spoon and discard. Add guanciale; cook and stir until crisp and golden, about 4 minutes. Add onion and red pepper flakes; cook and stir until onion is translucent, about 3 minutes. Stir in tomatoes, salt, and black pepper. Simmer tomato sauce until flavors combine, about 10 minutes. 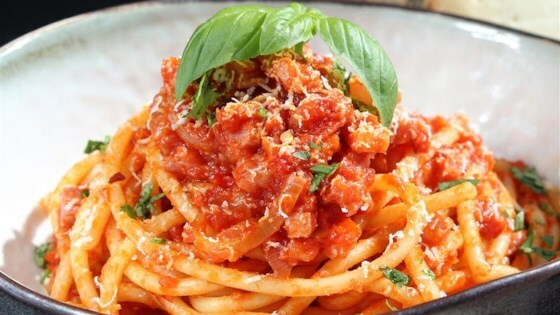 Stir bucatini and Pecorino Romano cheese into tomato sauce and toss until evenly coated. Good job! You teased me! Great recipe... I made it exactly except for subbing pancetta since that all I could find at the market. It was really tasty and I would make it again! I doubled the recipe, added some extra red pepper flakes and it was delicious! This was wonderful!! We ate it 2 days in a row for lunch, and I wouldn't change a thing with the recipe! This recipe has made its way into my cookbook for sure! It's very easy to make and my family loves it. Easy and delicious. I used pancetta and doubled the recipe. But, I used about 1/3 c olive oil. I'll definitely make again.